IBPS SO Admit Cards, IBPS Specialist Officers Admitcards, IBPS Specialist Officers(SOs) 2017 Main Exam Admit Cards, Call Letter / IBPS Specialist Officers(SOs) 2017 Main Exam #Admi Cards / #Callletters Download/ IBPS Specialist Officers cadre Posts 2017 Recruitment notification: Online application form, exam date, last date for apply online, hall tickets/admit cards, results, selection list more details are available ibps web portal http://cgrs.ibps.in/. Institute of Banking Personnel Selection (IBPS) has published notification to conduct online examination for the next Common Recruitment Process (CRP) for selection of personnel in Specialist Officers cadre posts. The online examination for the next Common Recruitment Process (CRP) for selection of personnel in Specialist Officers’ cadre posts listed below in the Participating Organisations is tentatively scheduled in January 2018. 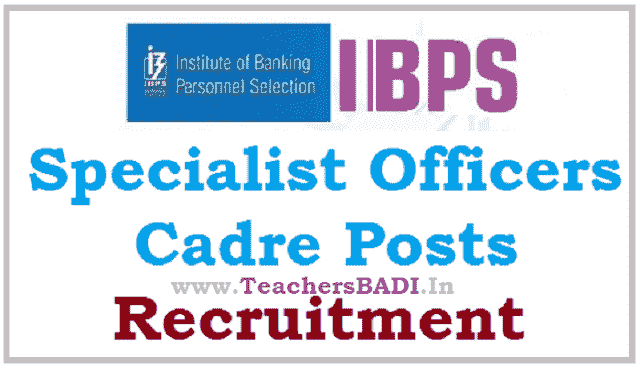 IBPS Specialist Officers(SOs) cadre Posts 2017 Eligibility Criteria, IBPS SOs 2018 Notification Selection Process, IBPS SOs 2018 Notification Vacancy Details, IBPS SOs Recruitment 2017 Application Process Begins On November 7, How to Apply for IBPS SOs 2018 Notification and IBPS Specialist Officers(SOs) cadre Posts 2017 Recruitment Scheme of Exam/Exam pattern details provided here. The Institute of Banking Personnel Selection (IBPS) on Friday released the call letter of candidates of the main exam (CRP SPL-VII) to recruit approximately 1,315 Specialist Officers (SO)in various public sector banks and other participating organisations. The results of the preliminary exam were declared last week. HOW TO DOWNLOAD: Go to the official website. Click on the link, 'Click here to download SO VII main exam call letter'. Enter your registration number and password. After submitting the same, the call letter will be displayed on the screen. Take a printout for future use. The exam is scheduled to be held on January 28 and the results for the same will be released in the month of February. The call letter will be available on the website until January 28. The online main exam to recruit Specialist Officers for candidates who have cleared the preliminary exam will be held on January 28. Out of the 1,315 posts, 120 posts are for IT Officer (Scale-I), 875 are for Agricultural Field Officer (scale-I), 30 are for Rajbhasha Adhikari (Scale-I), 60 are for Law Officer (Scale-I), 35 are for HR/Personnel Officer (Scale-I) and 195 posts are for Marketing Officer (Scale-I). IBPS Specialist Officers(SOs) 2017 Preliminary Exam Results Declared: Institute of Banking Personnel Selection, IBPS has declared the results for IBPS Specialist Officer, SO Preliminary 2017 examination. The link to check the results have been activated on the website. Candidates who have appeared in the examination would be able to check the result status fro late evening today on the official website ibps.in. IBPS had conducted the SO Prelims 2017 examination on December 30 and 31, 2017. Candidates would be able to check the results on the official website from late evening today. The link to check the results would also be provided on this page. Alternatively, candidates can check the result status by following the simple steps. Candidates who qualify the prelims would be called to appear in the IBPS SO Main examination 2017. The link to check the result would also be available once activated. Candidates are advised to note that the scores of IBPS SO Prelims 2017 would not be added for the creation of the provisional allotment list. The preliminary examination was only a qualifying round. The result status would be uploaded.. The scores for the examination would be made available on the official website in a few days' time. IPPS SO Admit Cards/ Call Letters: IBPS Specialist Officer 2017 Preliminary Exam Admit Cards released, download call letters from ibps.in now: Institute of Banking Personnel Selection, IBPS has released the admit cards for the IBPS Specialist Officer Preliminary 2017 examination. The call letters are now available on the official website ibps.in. Candidates who have applied for he IBPS SO 2017 examination can download the admit cards from the link provided below. The facility was activated today and would be available till December 31, 2017. IBPS SO 2017 preliminary examination is scheduled for December 30 and 31, 2017. Candidates are advised to download the call letters at the earliest from the official website. The date of the examination for the candidate along with the examination center would be available on the admit cards. Candidates can login to the official website by using their registration number and date of birth. Link to download the admit cards from the official website is provided below along with the steps to download the same.